If you prepare fresh chocolate milk at home, it is great to provide energy and activate the child’s body. They will be happy to go to school in the morning. Researches have shown that chocolate produces happy hormones, which are why people love eating it so much. You can add a little fruit in the chocolate milk mix and your child will not notice as chocolate’s fragrance plus taste stays in more than any other fruit in a milkshake. You add a spoon of chocolate powder and you will see how it makes a large different to boring milk. Adding a fruit will help the child in several ways. 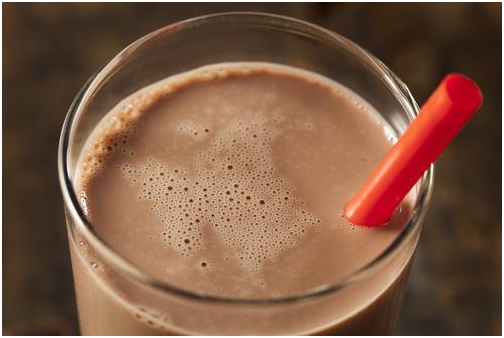 If your child is tired post school, they can have a small glass of fresh chocolate milk to regain the energy. This drink has protein and several other benefits to the health. Using dark chocolate will help your child as it is good for the heart and has many other benefits. You can order dark chocolate by post easily! If you are buying packaged chocolate milk that is a preservative, you need to stop. This will just affect your child’s health. You must use fresh milk and chocolate powder to make the drink in the morning. Preservatives are not good for the body and they mostly contain tons of sugar. Giving chocolate milk more than one time a day can be a little too much sweet for the kids. You should keep it in control and only prepare fresh milkshake once in a day. Milk chocolate should not be used to make chocolate milk at all. 1. With fruits – Include sweet fruits that are healthy like bananas, strawberries, cherries, etc. along with dark chocolate and milk for the shake. This will provide antioxidants, vitamins, minerals and several other things to their health. Not just your child, but you too can drink this every morning as a healthy breakfast meal. If you don’t have time to cut fruits every morning, you can just put all these in the blender along with some chocolate for taste. 2. As a smoothie – When you make smoothies, we usually include vegetables like spinach and fruits too. You can do the same and keep the quantity of the vegetables less. You can add extra dark chocolate so that your children don’t know that there is some other ingredient in this. Slowly they will get used to this taste and want to have this version of chocolate milk. The debate of chocolate milk has two ways, and if you keep it healthy, you can always give your children this drink. So, get healthy dark chocolates delivered to make fresh milkshake every morning.